If you need a nice ride in the great city Shenzhen, just simply contact us now to get our BEST QUOTES and GREATEST SERVICES today! Car rental serivice provider in Shenzhen China ! We drive your way in Shenzhen! Shenzhen is located at the southern tip of the Chinese mainland on the eastern bank of the mouth of the Pearl River and neighbors Hong Kong. Occupying an area of 1,953 square kilometers, the city has a subtropical marine climate with plenty of rain and sunshine and is rich in tropical fruit. By the end of 2009, there were 8.9123 million permanent residents. 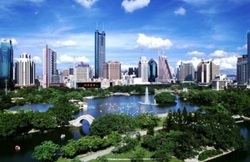 Since 1980 Shenzhen was established as the first special economic zone by Chinese Government under under the Opening door policy carried out by Dexiaoping. In less than 30 years , it has developed into a modern and one of the most developed metropolis. Shenzhen will host the 26th Summer Universiade in 2011; it will become the youngest city in game history to host such event .The Universiade is the third international sports competition to be hosted by a Chinese city after the Beijing Olympic Games and the Asian Games in Guangzhou. Shanghai Car Rental Service will be very honored to have the opportunity to serve you in Shenzhen with our great limousine services, we will insure a hassle-free, most comfortable trip no matter you are traveling Shenzhen for official business visits or personal tourists. All our drivers are from local and they are all licensed, well trained and with more than 6 years’ experience in serving our foreign customers, they are also quite familiar with the routes in Shenzhen and other cites in Guangdong province and can easily drive you wherever you want. ◆Shenzhen airport/ hotel transfer services ,hotel pick up and drop off.Shenzhen transfer to Hongkong airport or to Hongkong downtown.Hongkong airport pick to Shenzhen etc. ◆Grand transportation or transfer /shuttle services for Fair/ Event /Exhibitons in Shenzhen regions ( Convention center to hotel and hotel to convention center) ( MPvS, Luxury Sedan , buses and coaches are availale for such services ). ◆Shenzhen Daily Limousine or car rental services (chauffer services) for short term period, such as Shenzhen Business tours or factory visits to neighborhood such as Dongguan,Foshan, Jiangmen,Huizhou,Zhongshan,Qingyuan etc. City tour sedan /mini van/mini bus/coach services for individual or group travelers. ◆Long-term car lease for individuals or cooperates in Shenzhen.